With more than 18 years’ experience in our field, Essex based Able Canopies are the canopy experts for architects & designers, construction, education, hospitality, leisure and retail applications among others. We design, manufacture and install quality canopy, shelter and shade systems for schools and commercial organisations throughout the UK. We are based in Clacton-on-Sea, Essex and began trading over 15 years ago. 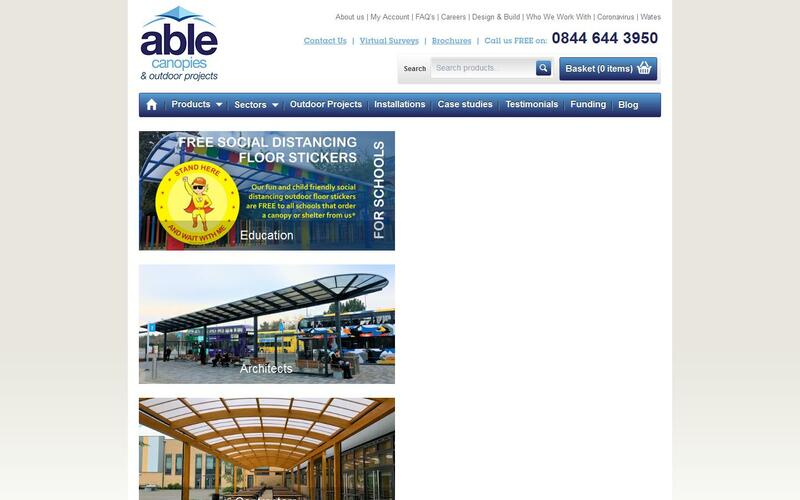 In that time we have completed hundreds of successful school canopy installations across the UK. Our very first product was the Coniston Wall Mounted Canopy, a commercial grade aluminium and uPVC system which created cost effective and efficient weather cover. A range of free standing canopies and shelters followed, all based on the continuing ethos of quality and longevity. These canopies provide schools with effective shelter and areas for outdoor learning and dining. We also work with universities and the retail, leisure & hospitality sectors to effectively transform outside space. Our team of canopy experts work with customers, architects and contractors to ensure on time, on budget, project completion. To ensure consistent high quality we control the design, manufacture and installation process of our canopies. We hold all the major quality and safety certifications including ISO, CHAS and Construction Line Gold. This is not something that we just say. Our processes are geared up to deliver the highest standards. Our supply chain has achieved CE marketing meaning our canopies are safe and fit for purpose. A big part of our continued success is our understanding of why schools, universities, retailers and leisure outlets want to be able to use outside space and what benefits it brings them. The ability to use the outdoors for teaching, dining and other activities is crucial to schools. That is why we focus on the key issues of position, flow of people and expected use when we come to survey. That way we make sure schools get exactly what they need. The same applies to commercial operations. If you want more covers at your restaurant then some canopies will work better than others. If you need a functional, yet stylish entrance canopy for your office building, shop or hotel then a thorough investigation of your requirements will make sure you get weather protection that does the right job. Our product range includes wall mounted canopies, free standing canopies, entrance canopies, solar canopies, walkway canopies, shade sails, cycle shelters, cycle compounds, waiting shelters, buggy shelters, and bin shelters. These are sold to sectors including schools, local authorities, sporting, leisure, hospitality, health and care. Offering a personal and friendly service, we ensure that each canopy is tailored to your individual needs and that you get the most from your investment. I’d be very surprised if you haven’t heard about the recent tragedies that have sadly covered our news screens in recent years regarding fires in public and residential buildings including blocks of flats. Campus Estate Management is a cutting edge and informative magazine that is targeted at staff within education establishments from primary schools through to universities and colleges. Little Dragons Pre School in Great Bromley are reaping the benefits of their new canopy which allows them to play and learn outside all year round. 21st November 2017 - Morwenstow based primary school, St Mark’s C of E have just enhanced their facilities with a new covered outdoor learning area so their pupils can gain access to the outdoors whatever the weather, allowing them to benefit from the sensory learning opportunities that the outdoors has to offer. Spixworth Infant School in Spixworth, Norwich have recently completed the expansion of their facilities with a new all-weather outdoor learning area that can be enjoyed all year round. Able Canopies have been very helpful all the way through the project, including great support with planning and building refutations. The installation team have been great as well. Excellent service from the outset. The product looks fantastic, the installation team were reliable and adhered to WCL H&S policies at all the time without the need to prompt. The Canopy has also received numerous positive comments from the client which is a credit to Able.